In woodturning, there are only a handful of basic profiles a woodturner would commonly cut when turning spindles on a wood lathe. There are just four different types of tools one would need to cut these shapes: the roughing gouge, spindle gouge, skew chisel and parting tool. Fillet - a fillet is a square cut into the wood stock like a rabbet or a dado. In many cases, a fillet may be cut to use as a tenon in a mortise and tenon joint. The most common tool for cutting a narrow fillet is a parting tool, as the width of the fillet would match the width of the parting tool. Wider fillets could be cut using a parting tool in multiple passes. Cove - A cove is a rounded concave groove or well cut out of the face of the turning. 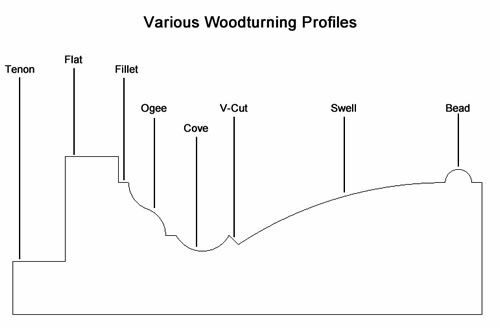 The width and depth of the cove cut will vary depending on the requirements of the turning, but in most cases, a roughing gouge would likely be the tool of choice for rough cutting and then rounding out the cove into the smooth, final arc. V-Cut - As the name implies, a V-cut is a groove cut into the shape of a V. This type of cut takes some patience and some practice, as it would be cut using a skew chisel to provide the two flat sides of the V. For a large V-cut, a roughing gouge or smaller spindle gouge might be used to remove most of the material before the final V would be cut using the skew chisel. Bead - A bead cut is the opposite of a cove cut, in that it is a convex cut with the protruding arc curving away from the center of the spindle rather than toward the center. This is one of the more challenging cuts to learn, as it requires patience and practice, as you'll essentially be cutting the opposite of the natural curve of the roughing or spindle gouge. Using a parting tool to cut the depths of the bead on either side and then rounding using one of the gouges is typically the best approach. Ogee - An ogee is an S-shaped curve that contains both a swell and a dip. As with the bead, it's best to define the outlines of the ogee with a parting tool before forming the shape with a gouge. Swell - a swell is a very large outwardly-protruding curve, much like a very wide bead. Again, the shaping of this curve will be done with a roughing gouge. Hollow - A hollow cut is the opposite of a swell, with the center of the arc protruding inward. Use a roughing gouge to shape this curve in the turning as well. Flat - A flat cut is, as the name implies, a flat cut parallel to the center of the spindle. This can be cut much like a fillet, but in many cases, this is the most outwardly protruding portion of the turning and simply roughing the blank to the position of the flat cut will create this feature without any additional effort. There are a considerable number of variations on these basic shapes. For instance, the radius of a cove cut might vary depending on the desired profile. To create coves of different depths and widths, the woodturner would likely choose to employ different widths of spindle gouges, as a spindle gouge cannot cut a narrower cove than the width of the tool. A narrow spindle gouge can be used to cut a wide cove (as long as the woodturner has the requisite skill level), but a wide spindle gouge cannot be used to cut a narrow cove, as it simply won't fit into the narrow area. What Is the Difference Between a Jigsaw and a Sabre Saw?